1. Our genes are programmed for health. It is toxicity and/or deficiency affecting gene expression that leads to sickness NOT faulty genes. 2. Our genes do not differ from our Paleolithic (early man), hunter-gatherer, pre-agricultural, pre-industrial ancestors. 3. Our ancestors, and surviving tribes that model their lifestyle, did NOT die from the diseases of lifestyle like heart disease, hypertension, cancer, diabetes and stroke or suffer from the degenerative diseases like arthritis, lupus, M.S., chronic fatigue, low fertility, depression etc. like modern humans do. 4. The only difference between our sick society and healthy ancestors is toxicity and deficiency. The genes are the same. 5. Modern illness is due to environmental NOT genetic factors. Modern illness is AVOIDABLE!! Modern health is ATTAINABLE!! Source: Innate Physical Fitness & Spinal Hygiene, James Chestnut B. Ed., MSc. D.C. In considering our four pillars of health (living well, eating well, moving well, thinking well), we need to keep the above truths in mind. I have ample resources and scientific references which support the above concepts to be true. When appropriate, I will share some of this support/research in these articles. Today I would like to look at the idea of moving well and more specifically that 1) we in general, are living a lifestyle that is far too sedentary, and as research shows, not congruent with early man (how we were genetically programmed to move/exercise) and 2) we will also see how this lifestyle of inactivity is a major contributor to the concepts of toxicity and DEFICIENCY (in this case, NOT enough exercise) contributing to all modern illness. And while I have dozens and dozens of references that support this hypothesis, we are limited here by the length of this article. I will share some highlights. Interpreting the above research and putting it into simple words, we as a society DO NOT move enough. Early man ran after his dinner. He (she) did not sit at the di nner table, drive through or buffet waiting to be served. 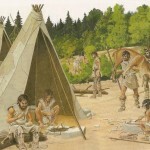 There was a tremendous amount of physical exertion that was a part of survival. That’s what is meant in the above research by the term “obligatory”. You either went out and chased down your dinner or you perished. Women typically foraged for nuts and berries. Physical activity was a part of survival for all family members. And as man “evolved” and entered the agricultural and industrial stages of evolution, we changed our eating and “moving” patterns. Research has shown that our genes are basically the same as “Paleolithic” man (early man). In 40,000 years our genetic make up is essentially unchanged. (Cordain et al. Physical Activity, Energy Expenditure and Fitness: An Evolutionary Perspective. 1998 Int. J. Sports Med. (19) 328-335). So when we hear or read articles in the news about this gene and that gene being responsible for this condition (obesity) or that disease (cancer, M.S. Parkinson etc. ), is it really the genes that are responsible? How come these conditions really never existed hundreds of years ago? As the research shows, it is not the genes in and of themselves that are responsible. As Bruce Lipton Ph.D. so beautifully puts it in his book entitled “The Biology of Belief” it’s not the genes…it’s the environment that stimulates our genes. Even chronic “sick” thinking can influence genetic expression. Genes don’t do ANYTHING until they are stimulated. Genes are like blueprints. They are waiting to be opened and read. It’s the environment that the human cells function in that initiates this “opening”. And so, as the research shows, just as the body needs good clean food; clean air and water; mental, spiritual and emotional balance; it also needs to move. Exercise and spinal movement is an essential nutrient no different from these others. Research also suggests that we should be exercising on a daily basis, at least ½ hour per day. Until next week, be well!